On the day it was announced that Fist of Fun would finally be released on DVD it was a curious coincidence that Stewart Lee gave us perhaps his silliest work since that much loved, but mostly ignored then axed BBC comedy series. 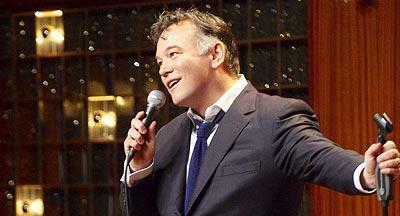 Against the odds, Stewart Lee’s Comedy Vehicle has returned for another series. And he’s dressed as a big lizard. Stewart (now aging with dignity into Morrissey’s approachable brother) began with a joke about his granddad being a Chelsea pensioner living in a nest woven from charity poppies. It was a really good opening joke. “It’s not a good opening joke!” shouted Lee, before we cut to one of the mock interview scenes with Armando Iannucci, now graduated from the Red Button content, where the comic was quizzed about his intentions to please the Internet naysayers by including more actual gags in his material this time. Some people, maybe even a lot of people, don’t get it. We get it. Personally, we’ve long thought Stewart was the best standup comedian working today – even when he was really lazy and mostly just did the same stuff year in year out. And now he puts the work in, with ever more uncompromising and deceptively smart routines, there’s really no one to touch him. Because despite the meta-self-deprecation, after 20 years in the business, Lee’s comedy is that of a master. He really does know what he’s doing. And it’s very funny. It just doesn’t necessarily have punchlines. But that’s life. We can’t scoff at those waiting for a pithy observation on modern life or a politically incorrect jibe at a sacred cow, because that’s what they like and it’s what they want. And a man getting a laugh simply by pausing after the phrase: “All the different flavours of crisps” is going to make as much sense as Miles Davis to a Mumford & Sons fan. We chose Miles deliberately because his music never used to make any sense to us. Why doesn’t he just get on with it and play a tune, we used to think. Now we like even the stuff people on the Internet tell us is rubbish. The stuff where he was covering Michael Jackson & Cyndi Lauper, in a nice fluffy way. Because it’s there you can hear Davis’ mind working; hear it searching for patterns, and spaces, and new places. And when he finds them… aw man, there’s nothing like it. Lee isn’t much like Miles Davis because he’s never been a heroin addict and he doesn’t perform improvised jazz. But he works in similar spaces – the gaps where our anticipation lives, where our logic and expectation tries to join the dots between some old men eating all the flavours of crisps and what will inevitably end up with a 43-year-old comedian in a Godzilla suit, hitting a big moth with a bag. But somehow not really be about any of that. With this new series of Comedy Vehicle, Stewart Lee seems to have gone beyond his trademark withering pedantry, protracted fantasies and over-analyzed petty annoyances to now be making comedy about comedy itself. And if you still don’t find it funny don’t worry, he probably won’t get another series. Stewart Lee’s Comedy Vehicle is on BBC2 on Wednesdays really late at night. But there’s always iPlayer.